A long time ago, my first full time job was in visual presentation of a department store. This was long before prelit trees and LEDs – rocking it old school with strings of lights, checking the bulbs before wrapping each branch with 1 string per branch, yes, 1 string of lights per branch. It was one of my favorite jobs, and I decorated dozens of trees and giant swags that hung across the aisle and hundreds of boxes wrapped perfectly for the windows. Since then, between working in several other display jobs and in the art department of the commercial film industry, I have easily decorated a couple of hundred trees. So for the love of holiday decorating, here are some of my favorites this year. HOW FUN! Vibrant pinks and blues mixed in with red and green makes this anything but traditional. Lively and whimsical – from the bright pink polka dot stocking to the perfectly decorated tree, this holiday decor wins with me. Cranberry and white are lively in this nearly neutral room. 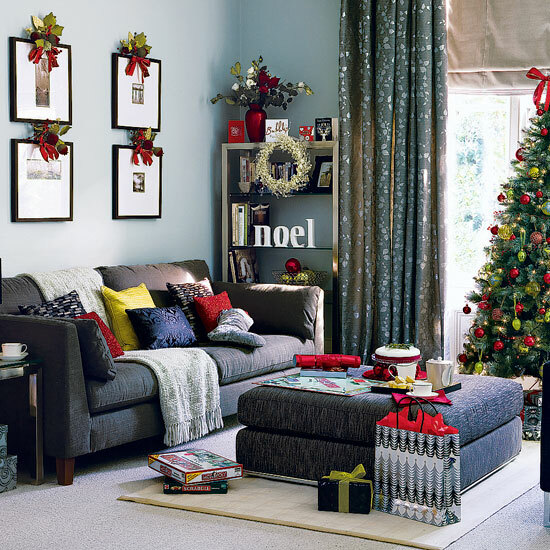 You can never go wrong with a strict colour palette, and the liberal dose of dark red on the tree, the cushions, the throw blanket, the wine glasses and the very fun framed letters above the fireplace is a gorgeous way to bring in the holiday decor. I also love the giant oversized snowflakes – remember making the little ones as a kid? Another great idea for simple, inexpensive but impactful decor. (can I just say that the area rug is TOO SMALL – common mistake 🙂 ) Red and gray are a great pair. The tradition of red, made more contemporary when paired with a fresh green. A tree loaded with red and fresh green glass balls is fantastic, and I love how the bookcase has been dressed up with a wreath, a bowl of baubles and the simple letters NOEL. More great ideas for you! The beauty of silver and white, with a touch of gold. Elegant and Etheral and Timeless. 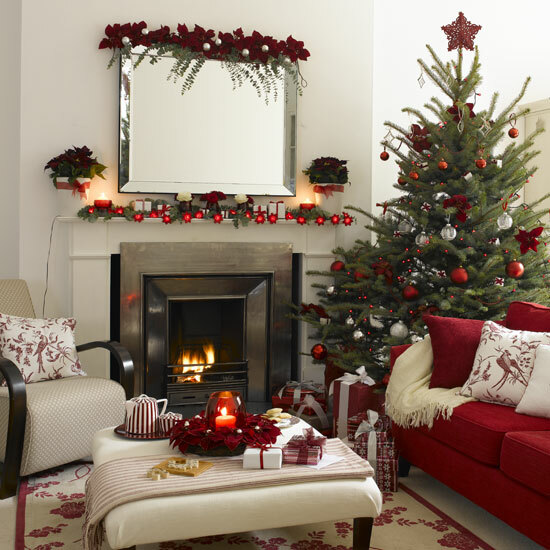 Subtle and understated, this holiday decor is darker and richer. I have never seen lights woven around a tree this way and I think it is highly creative. 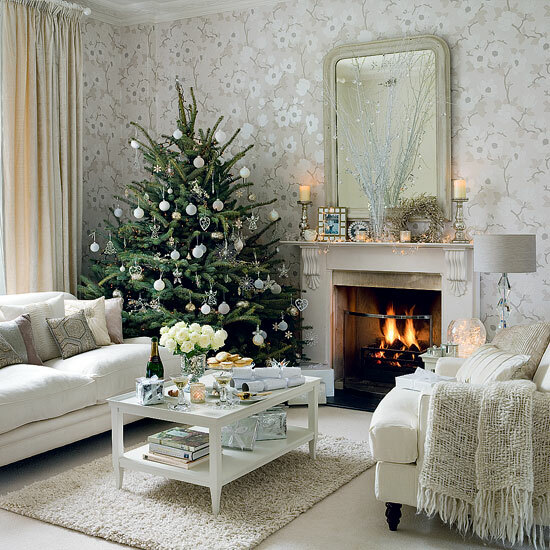 Usually, the best way to light the tree is with tonnes of lights (the aforementioned string per branch), woven through the interior of the tree to the end of the branches – this really gives depth to the tree and if you are someone who likes to load on the ornaments, it ensures they all sparkle. This tree lit this way, is much darker and does not have the same glow, but is great in this room that has much interest happening already. 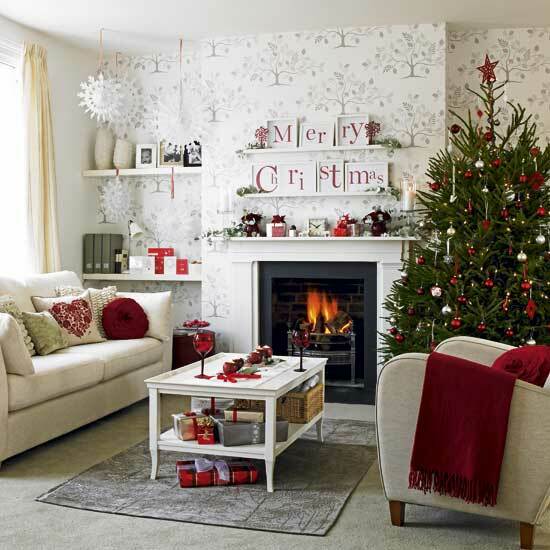 Red and winter white, a classic holiday colour combination. I love how this room feels so inviting. A natural tree decorated simply such as this one, is the exception to the can’t-have-enough-lights, and the red lights give a nice glow. My name is Sue Womersley and I am an Interior Decorator who loves to help clients decorate their homes.